Fort Snowhawk is a military fort located just west of Morthal. The fort has a courtyard and two interior zones: Fort Snowhawk and Fort Snowhawk Prison. This imposing keep serves as a point of contention between the Stormcloaks and the Imperial Legion during the Civil War. Until then, it's populated by a band of necromancers. You can tackle this eroding stronghold in a number of ways—storm the front gate, slip in through the hole in the southeast wall, or leap over any of the crumbling battlements. The courtyards outside the fort are quite confusing with many small interconnected areas with arches and flights of stairs leading to different levels. The main arch leading into the courtyard is to the south with several barricades in front, with the main entrance into the fort opposite. A host of necromancers and their skeletal minions defend the fort's exterior. There are numerous food barrels around the fort as well as a deathbell and snowberry bush growing in the courtyard and several places where the walls have crumbled that have been reinforced with wooden palisades. The western quadrant includes two gated stables, while the eastern quadrant has a covered well, with a wooden table beside it and two long bows and a quiver of iron arrows on top. Opposite the table are two archery targets and a practice dummy. To the left of these is the entrance to Fort Snowhawk prison with an alternative ground-level entrance to the interior of the fort opposite. Beside the well is a flight of stairs up, with a pressure plate at the top, that doesn't appear to have any effect, with a campfire and a cooking pot hanging over it nearby. There is also another table here with an imperial shield on top, regardless of who controls the fort. A third entrance to the interior of the fort can be found on an upper level to the north. 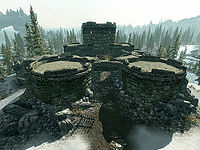 A ruined tower is in the northeastern corner of the fort with an expert locked chest among the masonry, take care as it can be a bit tricky getting back out, especially if overencumbered. You'll need to jump onto the chest then jump out or fast travel if no enemies are around. The main entrance to the south leads into a wide passage with a wooden door opposite that is barred from the other side and stairs leading up to the left and down to the right. Climbing the stairs to the left leads to the upper entrance which is guarded by two skeletons. Beside the entrance is a cupboard with a Scroll of Circle of Protection, a bowl of bone meal and a random potion of healing on the shelves. Beside the cupboard is a ladder to a trapdoor out on top of the main tower, there is nothing out there apart from the view. Backtracking down the stairs, to the right of the entrance is a cupboard with a random empty soul gem, a set of black mage robes, and four common books including An Explorer's Guide to Skyrim which may add several places to your main map, unless you have already found them. By the top of the stairs leading down is a barrel of ingredients. At the bottom a flooded passage heads to the southeast past a junction, with a decrepit kitchen on the right and a short passage on the left that ends after a couple of paces because it has been boarded up. Ahead is a flight of stairs up to a wooden gate with a button on the right that lowers it. The kitchen contains a wardrobe, a set of shelves holding two potions of minor healing, potion of minor stamina and an iron mace. Beside the shelves is a cupboard that holds only ruined books, but with a random battleaxe on the floor in front. Against the side wall is a wooden table with a random dagger and two charred skeever hides on top, while hanging above are two bunches of dried elves ear and a bunch of dried frost mirriam. In the eastern corner is an alcove containing an adept locked chest. Beyond the wooden gate is a large room containing seven unowned single beds. There are double doors opposite leading outside at ground-level opposite the entrance to the prison. There are small counters either side of the passage, with sabre cat pelt on the one and a rabbit and two bunches of dried elves ear hanging from racks over the other. There is dresser against the southeast wall with a copy of the Spell Tome: Candlelight on top. In the southern and western corners are stairs leading up to a balcony over the passage, with two doors leading off of it. The lower of the two leads to a two-level room containing a level necromancer and several crafting stations. There is an alchemy lab opposite the door with a small unit beside it, a counter against the northeast wall, a cupboard in the corner and a grindstone in front. There are stairs leading up to the upper level, where there a total of five sets of shelves, an arcane enchanter and a long wooden table. On the unit, shelves and counter are a total of; two butterfly wings, two blue butterfly wings, a bowl of troll fat, two taproots, a sample of scaly pholiota, a bunch of tundra cotton, a thistle branch, a sample of bleeding crown, a sample of Namira's Rot, a random potion of healing, a random potion of magicka, two sets of black mages robes, three bottles of wine, three bottles of alto wine, a garlic bulb, a drum, three loose septims, twenty-nine books, including a copy of The Aetherium Wars, a flute, a bunch of lavender, a sprig of snowberries, several cheese wheels, an iron mace, a potion of minor healing, a potion of minor stamina, and two food sacks. On the table is a letter that explains what happened at the fort recently and where the dead bandits came from, a copy of Fort Snowhawk quarters key and a copy of the Block skill book A Dance in Fire, v2. There is a Stormcloaks banner hanging above the shelves even when the fort is held by the necromancers. There is also a door to the southeast leading into a passage that leads from the other door on the previous balcony towards the southwest. The passage contains two more sets of shelves separated by a wooden table with a small unit opposite, these hold in total; four loaves of bread, a pickaxe, a sample of bleeding crown, a blue mountain flower, two bowls of ectoplasm, a sample of mudcrab chitin, two bunches of lavender, a nightshade flower, a bowl of bone meal and six more common books. At the end of the passage are two doors; one expert locked in front and an unlocked one on the left, that leads into a bedroom containing a leveled necromancer unless you've already dealt with them. The bedroom also contains an unowned double bed in the eastern corner with a wooden table to the left and an apprentice locked chest at the foot of the bed. On the table are two deathbell flowers, a copy of the Spell Tome: Raise Zombie, three common books and another copy of the Fort Snowhawk quarters key. There is a dresser and wardrobe in the room both containing clothes and behind the door a small shelf with an apothecary's satchel and two pieces of canis root. Through the expert locked door, which is opened using the key taken from the bedroom and crafting room, is a large round room with an altar in the center and the boss leveled necromancer wandering around it. There is a skeleton lying on the altar and a leveled one-handed weapon beside the altar. An unlocked boss chest is against the wall to the southeast, with a random warhammer beside it on the floor. There are a total of four sets of shelves around the room holding a bottle of alto wine, a bottle of wine, twenty-four more books, a sprig of snowberries, two random soul gems; one filled, one empty and several food sacks. To the southwest is a door barred from this side, with a woodcutter's axe on the floor in front. This opens opposite the main exit from the fort. You may find the prison deserted. The entrance leads directly into a room that has suffered quite extensive damage from a cave-in. There are two torture racks among the masonry and behind these is a warhammer randomly chosen from a leveled list, and further back, which can be reached with a bit of jumping is a set of shelves that have fallen flat that holds two random potions, a random empty soul gem, a medium coin purse and some ruined books. On your right when entering is a blood-soaked table with the corpse of a bandit and a random empty soul gem on top. Beside this is a cupboard with two random soul gems; one empty, one filled and a scroll of Raise Zombie on the shelves and another medium coin purse hidden behind. A doorway to the northeast has an elemental rune in front of it. Through the doorway is another blood-soaked table with a bowl of bone meal and an iron mace on top. Hanging above are two small cages, one contains a skeleton and the other another dead bandit, both of which can be looted. There are curved stairs leading down to the right. At the bottom is a large fireplace with an apprentice locked chest beside it and a cupboard to the right of that holding another random empty soul gem, a random potion of magicka, a random potion of resist element, a cow hide and a food sack. A long wooden table and chair are to the left of the passage leading to the cell, on top of which is a satchel, a random weapon, a copy of The Firmament and a small coin purse. Along the passage there is an arcane enchanter in a large cell with a torture rack and masses of human bones and opposite is an empty cell. At the end of the passage another cell on the left contains an unlocked chest, a cell containing the bodies of two bandits lying on hay piles and a third cell door with a tunnel behind leading to an alternative exit. There are a number of fungi along the tunnel and a ledge that stops you using this as an entrance. Take care dropping off the ledge as there are four bear traps on the lower level as well as the corpse of another bandit. There are a total of four bleeding crown, six fly amanita and two white cap fungi. It is very possible for the necromancers to exit an area as you're entering it or to flee from battle (via a loading screen door). In some cases, one leaves but when you follow there will be more than one. The main tower has three entrances. The top door contains two skeletons, the middle door (front entrance) contains a magic trap and a necromancer, and the lowest door (across from prison door) contains a necromancer and a skeleton. Snowhawk appeared as a settlement in Arena, and was mentioned in Oblivion. For historical information, see the lore article. This page was last modified on 9 November 2018, at 15:29.